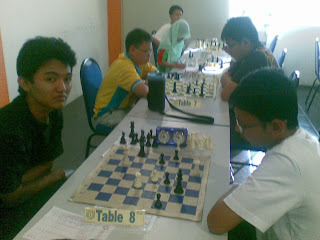 For Syed and Marzuki, try again to get ur 1st fide rating in next tournament. 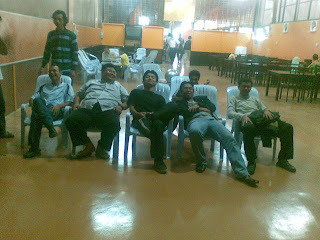 At 1st round all draw. The lack of a regular and predictable structure for top level chess is no doubt a factor in putting off many potential commercial sponsors to the game. The organisers of some of the most famous tournaments have been negotiating for two years to link their established chess events into an annual 'Grand Prix'. Teimour Radjabov , the final confirmed entrant. Vladimir Kramnik declined to play, perhaps due to his World Championship match with Anand in October, which starts barely a month later. Anand evidently feels that it will be a useful part of his preparation. Originally there were plans for a qualifying tournament in Mexico, but the finances have fallen through. However, there are further plans in place to introduce a qualifying event in Seattle in 2009 and tentative plans for an event in China by 2010. If this structure can survive and thrive it promises an incredibly strong final every year. This year's line up is truly mouth watering and should be a feast of exciting chess. Chess originated in India, where its early form in the 6th century was chaturanga, which translates as "four divisions of the military" – infantry, cavalry, elephants, and chariots, represented respectively by pawn, knight, bishop, and rook. In Persia around 600 the name became shatranj and the rules were developed further. Shatranj was taken up by the Muslim world after the Islamic conquest of Persia, with the pieces largely retaining their Persian names. In Spanish "shatranj" was rendered as ajedrez, in Portuguese as xadrez, and in Greek as zatrikion, but in the rest of Europe it was replaced by versions of the Persian shāh ("king"). Knights Templar playing chess, Libro de los juegos, 1283.The game reached Western Europe and Russia by at least three routes, the earliest being in the 9th century. By the year 1000 it had spread throughout Europe. Introduced into the Iberian Peninsula by the Moors in the 10th century, it was described in a famous 13th century manuscript covering shatranj, backgammon, and dice named the Libro de los juegos. Another theory, championed by David H. Li, contends that chess arose from the game xiangqi, or at least a predecessor thereof, existing in China since the 2nd century BC. Original Staunton chess pieces by Nathaniel Cook from 1849Around 1200, rules of shatranj started to be modified in southern Europe, and around 1475, several major changes rendered the game essentially as it is known today. These modern rules for the basic moves had been adopted in Italy and in Spain. Pawns gained the option of advancing two squares on their first move, while bishops and queens acquired their modern abilities. This made the queen the most powerful piece; consequently modern chess was referred to as "Queen's Chess" or "Mad Queen Chess". These new rules quickly spread throughout western Europe, with the exception of the rules about stalemate, which were finalized in the early nineteenth century. 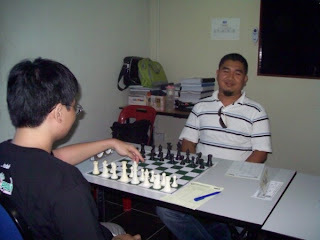 This was also the time when chess started to develop a corpus of theory. The oldest preserved printed chess book, Repetición de Amores y Arte de Ajedrez (Repetition of Love and the Art of Playing Chess) by Spanish churchman Luis Ramirez de Lucena was published in Salamanca in 1497. Lucena and later masters like Portuguese Pedro Damiano, Italians Giovanni Leonardo Di Bona, Giulio Cesare Polerio and Gioachino Greco or Spanish bishop Ruy López de Segura developed elements of openings and started to analyze simple endgames. François-André Danican Philidor, eighteenth century French chess MasterIn the eighteenth century the center of European chess life moved from the Southern European countries to France. The two most important French masters were François-André Danican Philidor, a musician by profession, who discovered the importance of pawns for chess strategy, and later Louis-Charles Mahé de La Bourdonnais who won a famous series of matches with the British master Alexander McDonnell in 1834. Centers of chess life in this period were coffee houses in big European cities like Café de la Régence in Paris and Simpson's Divan in London. As the nineteenth century progressed, chess organization developed quickly. Many chess clubs, chess books and chess journals appeared. There were correspondence matches between cities; for example the London Chess Club played against the Edinburgh Chess Club in 1824. Chess problems became a regular part of nineteenth century newspapers; Bernhard Horwitz, Josef Kling and Samuel Loyd composed some of the most influential problems. In 1843, von der Lasa published his and Bilguer's Handbuch des Schachspiels (Handbook of Chess), the first comprehensive manual of chess theory. The "Immortal Game", Anderssen-Kieseritzky, 1851The first modern chess tournament was held in London in 1851 and won, surprisingly, by German Adolf Anderssen, relatively unknown at the time. Anderssen was hailed as the leading chess master and his brilliant, energetic — but from today's viewpoint strategically shallow — attacking style became typical for the time. Sparkling games like Anderssen's Immortal game or Morphy's Opera game were regarded as the highest possible summit of the chess art. Deeper insight into the nature of chess came with two younger players. American Paul Morphy, an extraordinary chess prodigy, won against all important competitors, including Anderssen, during his short chess career between 1857 and 1863. Morphy's success stemmed from a combination of brilliant attacks and sound strategy; he intuitively knew how to prepare attacks.Prague-born Wilhelm Steinitz later described how to avoid weaknesses in one's own position and how to create and exploit such weaknesses in the opponent's position. In addition to his theoretical achievements, Steinitz founded an important tradition: his triumph over the leading German master Johannes Zukertort in 1886 is regarded as the first official World Chess Championship. Steinitz lost his crown in 1894 to a much younger German mathematician Emanuel Lasker, who maintained this title for 27 years, the longest tenure of all World Champions. Wilhelm Steinitz, the first World Chess ChampionIt took a prodigy from Cuba, José Raúl Capablanca (World champion 1921–27), who loved simple positions and endgames, to end the German-speaking dominance in chess; he was undefeated in tournament play for eight years until 1924. His successor was Russian-French Alexander Alekhine, a strong attacking player, who died as the World champion in 1946, having briefly lost the title to Dutch player Max Euwe in 1935 and regaining it two years later. Since the end of 19th century, the number of annually held master tournaments and matches quickly grew. Some sources state that in 1914 the title of chess grandmaster was first formally conferred by Tsar Nicholas II of Russia to Lasker, Capablanca, Alekhine, Tarrasch and Marshall, but this is a disputed claim. This tradition was continued by the World Chess Federation (FIDE), founded in 1924 in Paris. In 1927, Women's World Chess Championship was established; the first to hold it was Czech-English master Vera Menchik. World Champions José Raúl Capablanca (left) and Emanuel Lasker in 1925After the death of Alekhine, a new World Champion was sought in a tournament of elite players ruled by FIDE, who have, since then, controlled the title. The winner of the 1948 tournament, Russian Mikhail Botvinnik, started an era of Soviet dominance in the chess world. Until the end of the Soviet Union, there was only one non-Soviet champion, American Bobby Fischer (champion 1972–1975). Current World Champion Viswanathan AnandThe next championship, the so-called Match of the Century, saw the first non-Soviet challenger since World War II, American Bobby Fischer, who defeated his Candidates opponents by unheard-of margins and clearly won the world championship match. In 1975, however, Fischer refused to defend his title against Soviet Anatoly Karpov when FIDE refused to meet his demands, and Karpov obtained the title by default. Karpov defended his title twice against Viktor Korchnoi and dominated the 1970s and early 1980s with a string of tournament successes. The FIDE World Chess Championship 2006 reunified the titles, when Kramnik beat the FIDE World Champion Veselin Topalov and became the undisputed World Chess Champion. In September 2007, Viswanathan Anand became the next champion by winning a championship tournament. Again , Ian Udani show his magnifient performance by winning Taylor University College Open.He only draw with Abdullah Che Hassan at last round and winning rest of his game. current champion and having won there an amazing 8 times over 15 years! The youngest ever female to become a grandmaster (not to be confused with the lesser Woman Grandmaster title) is Koneru Humpy, who achieved the title at 15 years, 1 month, 27 days. Magnus Øen Carlsen (born November 30, 1990 in Tønsberg, Norway) is a Norwegian chess Grandmaster and chess prodigy. On April 26, 2004 Carlsen became Grandmaster at the age of 13 years, 4 months, and 27 days, the third youngest Grandmaster age in history. Since then, he has established himself as an elite Grandmaster. In the April 2008 FIDE list, he has an Elo rating of 2765, making him Norway's number 1, World Juniors' number 1 and World's number 5. Carlsen lives in Lommedalen, Bærum, near Norway's capital, Oslo. He played his first tournament at the age of eight and was coached at the Norwegian high school for top athletes led by the country's top player, Grandmaster (GM) Simen Agdestein. Agdestein put his civil worker and master player Torbjørn Ringdahl-Hansen, currently a FIDE master with IM and GM norms, as his coach and they had one training session every week, together with one of Magnus' close friends. 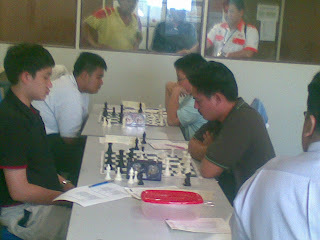 The young International Master was given a year off from elementary school to participate in international chess tournaments during the fall season of 2003. In that year, he finished third in the European Under-12 Boys Championship.Carlsen obtained his second GM norm in the Moscow Aeroflot Open in February 2004. In a blitz chess tournament (where players have much less time for their moves than in normal chess) in Reykjavík, Iceland, on 17 March 2004, Magnus Carlsen defeated former world champion Anatoly Karpov. 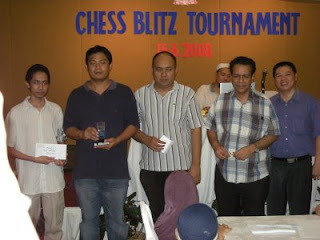 The blitz tournament was a preliminary event leading up to a rapid chess knock out tournament beginning the next day, where Carlsen achieved one draw against Garry Kasparov, who was then the top-rated player in the world, before losing to Kasparov after 32 moves of the second game, thus being knocked out of the tournament. In the sixth Dubai Open Chess Championship, held 18 April to 28, 2004, Carlsen obtained his third Grandmaster norm (enough for getting the GM title), after getting four wins and four draws before the last game was to be played. 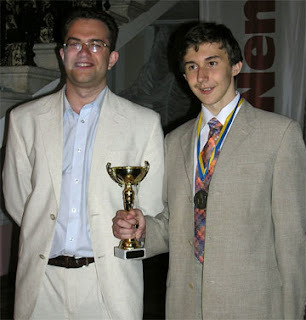 Resulting from this he was at the time world's youngest GM and the second youngest person ever to hold GM status, after Sergey Karjakin of Ukraine who attained the feat at 12 years and 7 months of age in 2002. 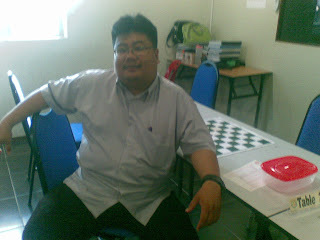 At the end of 2005 he participated at the World Chess Cup in Khanty-Mansiysk, Russia. 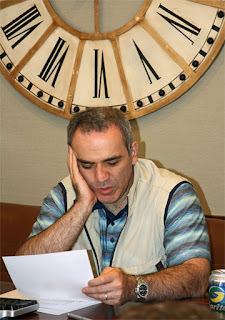 In the knock-out tournament, Carlsen upset the 44th-ranked Georgian Zurab Azmaiparashvili in round one, winning 2–0 at rapid chess after a 1–1 tie in the normal length games, and proceeded to beat Tajik Farrukh Amonatov and Bulgarian Ivan Cheparinov (also after rapid chess) to reach the round of 16. There he lost 1½-2½ to Evgeny Bareev, which prevented him from finishing in the top eight. He then won against Joel Lautier 1½-½ and Vladimir Malakhov 3½-2½ securing him at least a tenth place and therefore a spot in the Candidate Matches. 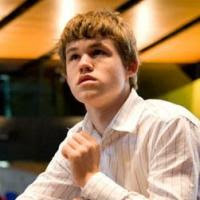 Carlsen became the youngest player to be an official World Championship Candidate. * Playing for the second time in the top group A of the Corus chess tournament, Carlsen showed big improvement over his 2007 performance. 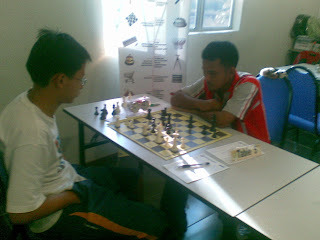 His final score was 8 points in 13 rounds, an ELO performance of 2830. Carlsen scored five wins (including beating former World Champion Vladimir Kramnik with the black pieces), two losses and six draws. He shared first place with Levon Aronian, becoming the youngest person ever to win a category 20 tournament. * At the 2008 Linares chess tournament, Carlsen had another 2800+ ELO performance, scoring 8 out of 14 (five wins, three losses and six draws). He finished in sole second place, ½ point behind the winner, world champion Viswanathan Anand. 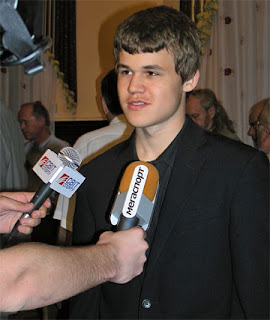 * In March 2008, Carlsen played for the second time in the Melody Amber blind and rapid chess tournament, which was held in Nice for the first time. 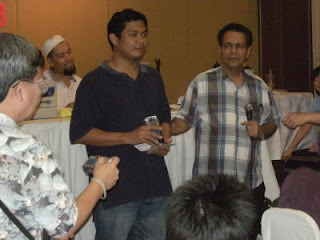 In the 11 rounds he achieved four wins, four draws and two losses in the blindfold, and three wins, six draws and two losses in the rapid part. 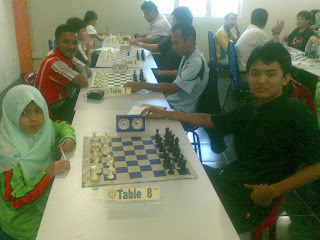 This resulted in a shared fifth place in the blindfold, shared third place in the rapid and a shared second place in the overall tournament. * Carlsen entered the first Grand Prix Tournament in Baku, Azerbaijan as a top-seed. After yet another 2800 ELO performance (four wins, one loss and eight draws), he finished in a three-way tie for first place. * Carlsen won a rapid match against Peter Leko held at Miskolc, Hungary, scoring 5:3 (two wins, six draws). * In June, Carlsen won an annual Aerosvit event. In his strongest tournament performance to date, he finished undefeated with 8 out of 11 (five wins, six draws) in a category 19 field. His performance ELO was 2878. 18.06.2008 – Vassily Ivanchuk defeated Loek van Wely with the black pieces to join Pavel Eljanov (who drew against Karjakin) in second place. Alexei Shirov defeated Peter Svidler in a Slav, and Magnus Carlsen drew a marathon 79-move game against birthday boy Andrei Volokitin. With a round to go Carlsen is a point and a half ahead and therefore already the winner of Aerosvit 2008. Round ten report. The "Aerosvit-2008" tournament is taking place in a sanatorium complex in the settlement Foros of AR Crimea, Ukraine, from June 7th (day of arrival), to June 20th, 2008 (day of departure). 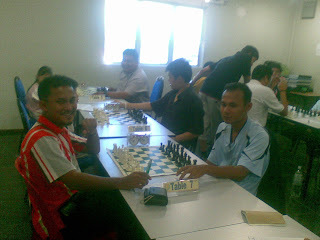 The event is a 12-player round robin with invited participants. The average rating of the players is 2711.7, time controls are 90 minutes for the first 40 moves and 30 minutes to the end of the game, with an addition of 30 sec. after every move. In case of equal points at the end of the tournament the tiebreak is based on the (1) the result of the direct encounter; (2) the Sonneborn-Berger system; (3) the number of won games. The rounds are from Sunday, June 8th until Thursday, June 19th, always starting at 15:00h local time, which is currently CEST +1 (14:00h Berlin/Paris, 13:00h London, 08:00 a.m. New York).